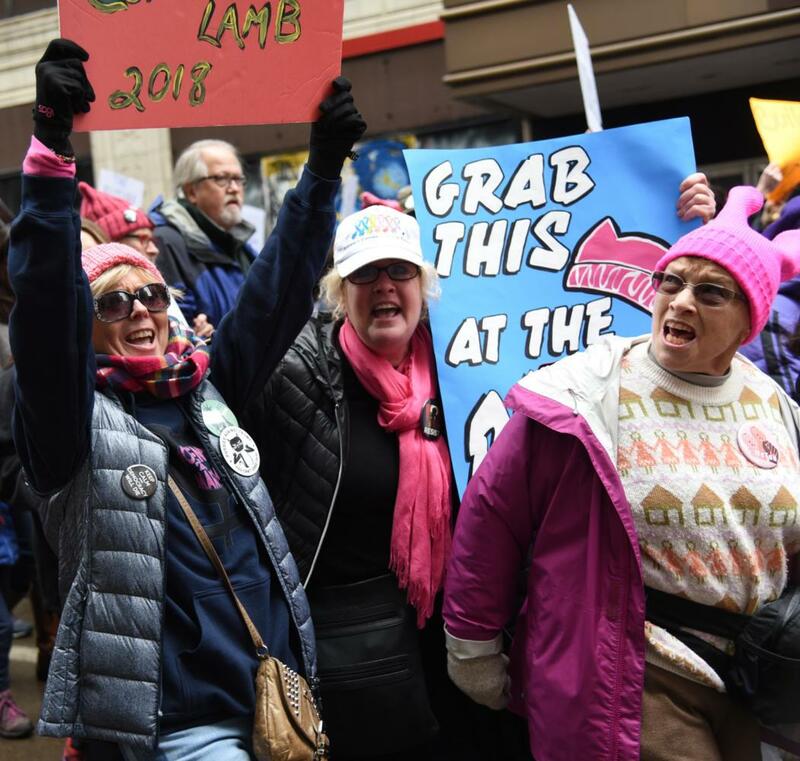 One day after the anniversary of Donald Trump’s tenure in the White House, downtown Pittsburgh looked a lot like it did a year ago — dense with the picket signs and pink hats common among the president’s opposition. According to organizers, nearly 30,000 people — including women and others who support women’s rights or oppose Trump’s agenda — gathered to march Sunday morning. The event, billed on Facebook as the “Women’s March on Washington: Pittsburgh — Power to the Polls,” was a callback to last year’s original Women’s March, which drew more than two million participants globally and around 25,000 in Pittsburgh. One key distinction between last year’s march and this year’s — besides the surprising increase in attendance here in Pittsburgh — was the content of the signs protesters waved in the air. In addition to the seemingly endless iterations of the standard “resist” catchphrase, were campaign signs, calls to register to vote and admonitions to remember the 2018 Congressional midterms. If there were any doubt in the past that the opposition to Trump’s administration would do anything more than simply fizzle out, it’s hard to deny it now. More than ever before, yesterday’s march showed an anti-Trump opposition that Republicans will have to take seriously this November. Perhaps the candidate with the most signage at the rally was Conor Lamb, a Democrat running in a special election this March for Republican Tim Murphy’s old seat representing Pennsylvania’s 18th district in the House of Representatives. Lamb’s candidacy in the Republican-leaning district has already instigated a massive inflow of resources from the Republican Party’s national leadership, with conservative donors spending $350,000 on campaign advertisements and Trump himself visiting a factory in the district last week. It’s still too early to know for sure whether or not the political momentum against Trump will last until midterms in November — or even until the next special election. But with a Democratic surge in special elections from Alabama to Wisconsin throughout 2017 and into 2018 and rising levels of participation from women and other key Democratic constituencies in politics at every level, it’s easy to see it persisting. At the forefront of this sustained movement are women. Emily’s List, a group advocating for female participation in electoral races, only saw 920 women inquire about running for office in the 2016 general election — but 19,000 since then. Women continue to be more likely than men to strongly disapprove of Trump by significant margins across class and racial groups, according to a SurveyMonkey report of polls aggregated throughout 2017. And women have played a strong role in political discourse since Trump’s inauguration last year, especially as the #MeToo movement took hold last fall. Women are a central part of an energized progressive response to the Trump administration. If Democrats want to continue to tap into the enthusiasm and energy on display this weekend on the streets downtown, they should keep that reality in mind.